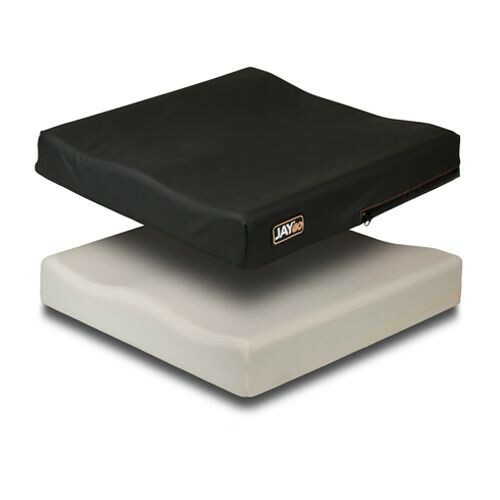 The dual-layer of soft foam within the JAY GO™ Cushion by Sunrise Medical provides pressure and shear reduction for users who are susceptible to decubitus ulcers requiring mild stability. The dual-layer foam is also mildly contoured allowing the seat bones to center in the rear of the cushion without restricting movement. This allows user to have a stable base with support and change positions as needed. The stretchable Dartex moisture resistant cover is also designed to reduce shear and peak pressure buildup. The cover is constructed with an Aqua-guard zipper and anti-wicking thread to protect the foam in between cleanings. Monthly cleaning of the foam wheelchair cushion is recommended by simply removing the zippered cover and wiping the foam base with a moist towel. Do not submerge in water or use soap to clean the cushion. The Dartex moisture resistant cover can be tossed into the wash. Zip it up before washing it and either drip dry or place in the dryer. Do not reassemble until completely dry. When needing additional postural and sacral support try the Sunrise Medical JAY X2 wheelchair cushion with additional foam contouring notched out in the rear of the cushion to reduce pressure from the coccyx bone.